I've searched lots of free resources online but cannot find the answer. 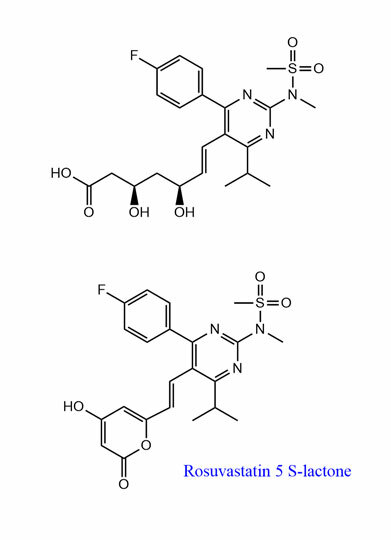 the top compound is Rosuvastatin. 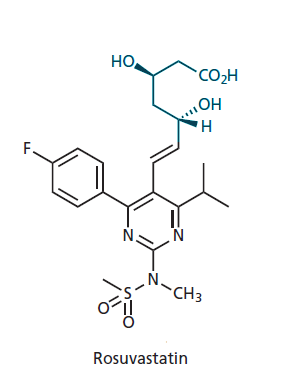 Some websites say it is metabolized by the enzyme CYP2C9, but I can't figure out how a CYP450 mediated reaction will produce Rosuvastatin 5 S-lactone. And I tried thinking about an intramolecular esterification, but it does not look like the answer. Perhaps I missed something? Rosuvastatin is metabolized to a limited extent by CYP2C9 to form an N-desmethyl metabolite and the other metabolite is the rosuvastatin lactone. Unlike other statins, rosuvastatin undergoes relatively little metabolism by hepatic CYPs with no significant involvement of CYP3A4. The metabolism of statins is complex, involving the inter-conversion of acid/lactone by various pathways. The acid forms are converted to the corresponding lactones via a glucuronide intermediate. Here is the proposed, generalised metabolic pathway of statins. 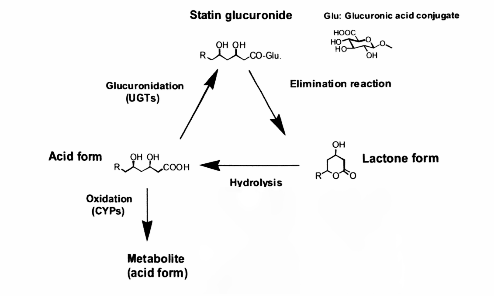 The acid forms of statins are converted to the corresponding lactones via a glucuronide intermediate via an elimination reaction. Focus on Statin research. B. A. Wong: Drug Metabolism and Transporter profiles of Statins. Not the answer you're looking for? Browse other questions tagged organic-chemistry reaction-mechanism drugs pharmacology or ask your own question. How does Grignard reagent form?